Why Dave Why??? : As I was growing up down here in Australia, the only wrestling I was exposed to was the WWF. Then in 1988, I discovered “Pro Wrestling Illustrated”. The first issues I ever saw were the WrestleMania IV recaps, but the magazine was gushing all over the NWA Clash of Champions card. It was my first exposure to non-WWF wrestling. They said this was an amazing card that stomped all over the action at WrestleMania IV. When I finally got access to the WWE network, it was one of the first cards I sat and watched. The reason this was chosen for the adventure this week was that I was interested to how it held up after all these years, especially as the Place to Be Podcast is in the middle of reviewing 1988 WWF. Brian Bayless: This show was all about the matches as opposed to the “segments” but if I had to choose I guess the interaction between Jim Cornette and Ken Osmond (Eddie Haskell). It wasn’t great, but better than the interviews that took place on the show and Osmond was a good sport. Jacob Williams: The chaos that ensued after the Midnight Express match was only rivaled by the match itself. Calum McDougall: My segment of the night is everything that involved the Midnight Express vs. the Fantastics. You got the sense that these four men hated each other and James E. even got a good amount of licks in I felt the same as the crowd in the arena who were hot throughout, I loved it. 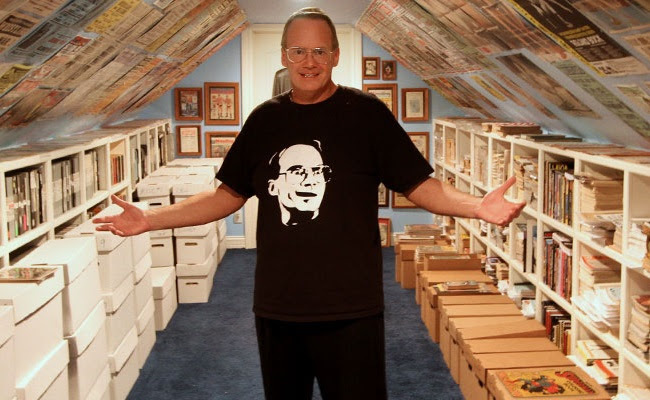 Dave Hall: Jim Cornette whipping the Fantastics. After a great match, we were treated to a post-match brawl, and Cornette whipping Bobby Fulton with a belt. It generated great heat, and added fuel to the fire of this feud after the “Dusty” Finish. Cornette played the part of the furious and crazed manager, while Eaton and Lane kept Rogers at bay. Simple but effective. Brian Bayless: The Fantastics vs. Midnight Express for the U.S. Tag Team Titles packed an incredible amount of action in a little under ten minutes. The match started off with a wild brawl and the heat was maintained throughout. The finish was weak (somewhat of a theme tonight) but I guess that was how they wanted to keep this feud going. Jacob Williams: As epic and important as Flair/Sting was, I have to give it to Midnight Express vs The Fantastics by a hair. It was just ten minutes of (total) nonstop action with insane crowd heat. Every single person involved, including Cornette, went full bore. Calum McDougall: Will I honor one of my correct answers in the recent PTB500 Trivia Contest and pick Rotundo vs Garvin? In a word…no! 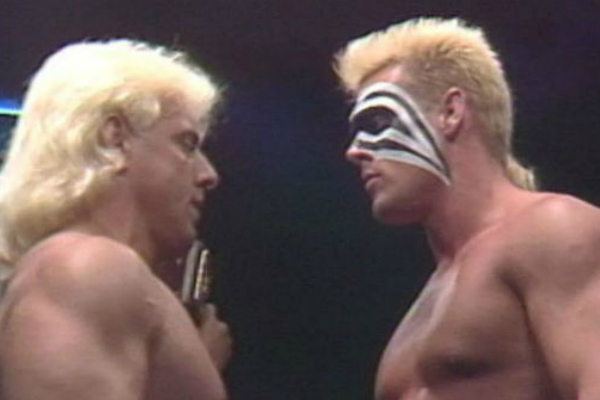 Sting vs Flair is the best match on a fantastic show. Probably the most famous match of these their rivalry, it was a 45 minute draw that felt less than half that time. What can I say that hasn’t been said before? 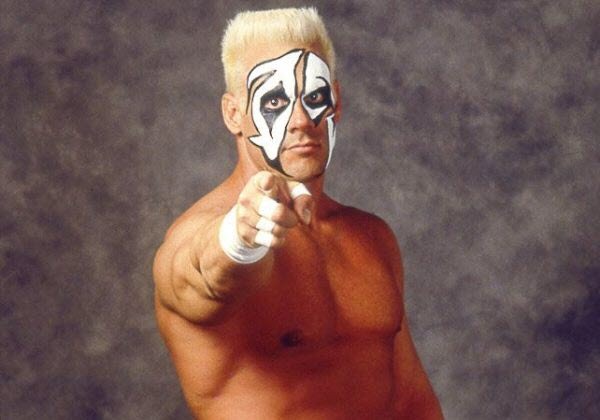 It was a star making performance that began Sting’s ascent into becoming the franchise of WCW. All the stars! Dave Hall: With several strong contenders for match of the night, I went with the Midnights vs. the Fantastics. This match was non-stop action from the moment the teams got in the ring. It was fast-paced, great double team moves, outside the ring action, and a strong post-match angle. The “Dusty Finish” was not necessary, but it did not detract from the match. Brian Bayless: “Dr. 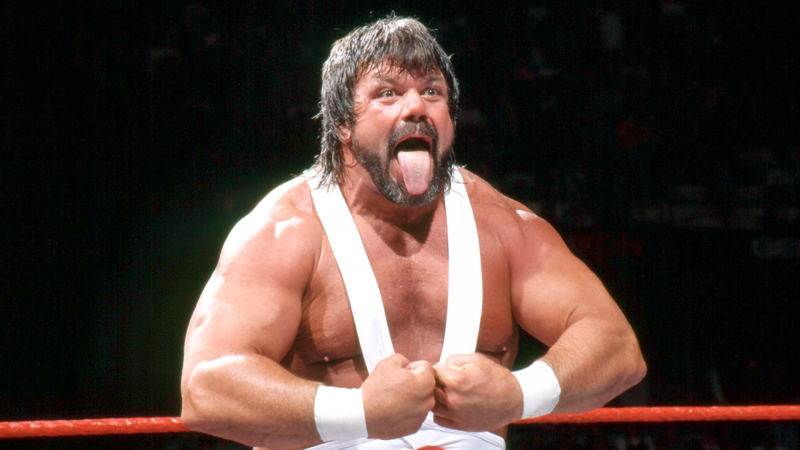 Death” Steve Williams’ return interview from Japan was horrendous. He tripped all over his words while talking about challenging Ric Flair! Later on in the show when I saw Al Perez’s interview (Perez was not good on the stick and lacked charisma) with Gary Hart as his manager, it was clear that Hart should have been managing Williams and they should have made Williams heel. Jacob Williams: Dr. Death stumbled through his promo. He kept pausing and skipping like he was malfunctioning. Calum McDougall: Dr. Death’s interview with Bob Caudle was the most cringeworthy moment on this show – it was painful to watch and listen to. He said a lot of words but didn’t say anything of substance at all! Is he Dusty’s friend? Is he his enemy? I think he challenged Ric Flair but I’m not entirely sure. Why don’t you just use this time to reintroduce him by killing a jobber? You know, what he’s good at! Dave Hall: After an amazing main event where Flair and Sting tore the house down, we were subjected to a “judges’ decision” in which non-wresting celebrities were used, and one of the “wrestling legends” voted for a draw. You have a judge there to make a decision when one is not achieved in the match. I thought this was really stupid and a waste of time. Brian Bayless: “Get high on sports, not drugs.” – Bob Caudle’s deadpan delivery while reading off of the poster Nikita Koloff held up during his promo about teaming with Dusty Rhodes for the Crockett Cup. Jacob Williams: In an incredible heel move, Cornette just blasts the ref with his racket on his way backstage. 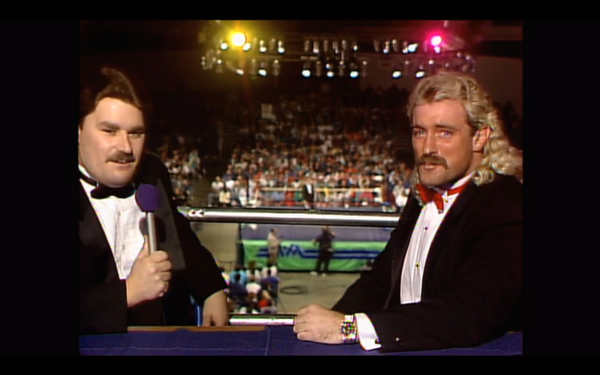 Dave Hall: For me the funniest moment of the night was when, early in the event, the commentators were talking about the crowd at this NWA event, and the camera panned to a young fan cheering wildly. Clearly wearing a Jake “The Snake” Roberts t-shirt. The most important mustaches in the history of our sport. Brian Bayless: The other Tag Team Title match was also a blast with Lex Luger & Barry Windham winning the titles. he main event of Ric Flair vs. Sting for the NWA World Heavyweight Title started off slow but built up well and ended up being a damn good match. 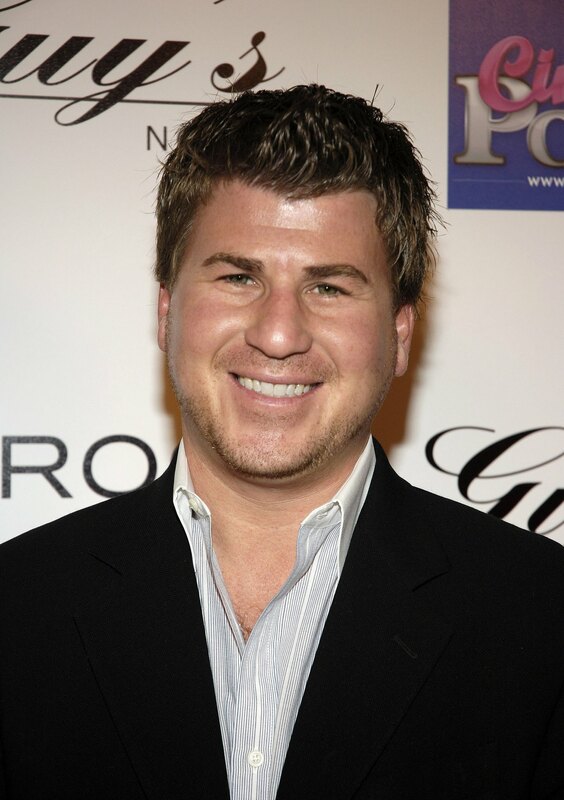 Jacob Williams: I loved the construction of the show. Aside from the lame opener, the show really built well and flowed into the huge main event. The two marquee tag matches were amazing. The crowd was nuclear and made nearly every match seem huge. There were a few slow spots in the main event, but the best moments are what wrestling is all about. Calum McDougall: Straight out the traps in this show with Tony Schiavone’s majestic mustache, then we move straight to Randy Anderson’s permed mullet – if you meshed the two together you’d get Ross Gellar in a flashback episode of Friends. The post match of the TV Title match is outstanding too, with Precious being my MVP, she was absolutely fantastic. And finally, Dusty Rhodes’ face paint – I like when guys try to blend in with their partners, like Ahmed Johnson at WrestleMania 13 and Kurt Angle at TLC ’17. Dave Hall: This was a strong card, with several really good matches. The NWA really put on a solid event to counter WrestleMania IV. The Main Event was a coming of age party for Sting, and Flair was at his in-ring best. The Tully/Arn vs Windham/Luger match was very good as well, with a good finish that really popped the crowd. As mentioned the Midnights vs Fantastics was an awesome fast-paced match. I even enjoyed the “unique rules” of the Garvin vs Rotunda match. While it was not a blow-away match, the one count rule made for interesting psychology, which both wrestlers and the commentators played up, and the “round” idea was different. I don’t know that I would want to see such a match again, but I enjoyed the unique way it was done. Brian Bayless: Not much to complain about on this show but selling the main event as having judges make a decision in case of a draw then not even having two of the judges give a score while the tie-breaking judge scores it a draw makes you think why even have them to begin with? Jacob Williams: The opener was very flat, especially compared to the energy of everything else on the show. Really the only lowlight, as I thought the barbed wire match was at least an interesting novelty that didn’t overstay its welcome. Calum McDougall: Every. Single. Interview. They were all so dull, and I completely zoned out when they came on. The Barbed Wire six man was pretty bad too, whole lot of nothing. 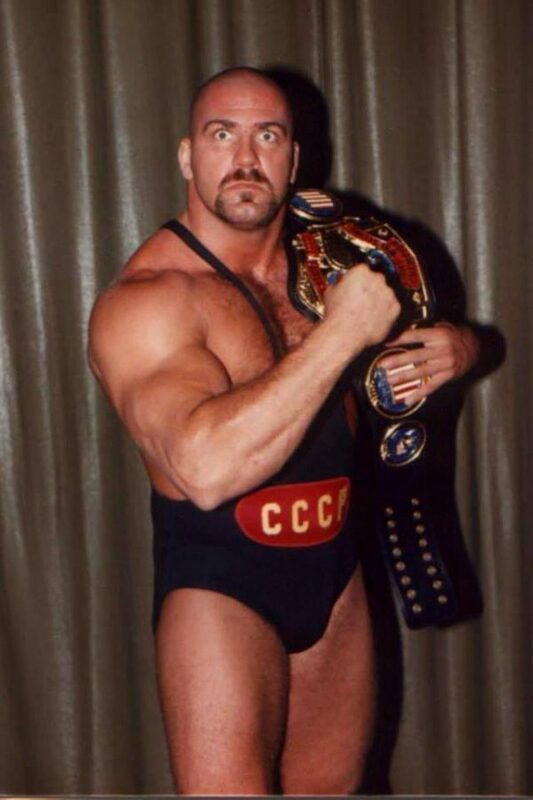 And Nikita Koloff with hair, that was a striking visual that I wasn’t expecting, some guys just should stay bald. Dave Hall: For me the only in-ring lowlight was the Road Warriors/Dusty Rhodes match vs Powers of Pain/Ivan Koloff match. With all six in the ring at once, it looked more like a battle royal, and how can you have a barbed wire match and not use the wire? It looked like all six men were trying to avoid the edge of the ring, and finish as quick as they can. Total waste of time. The other lowlight was the use of “judges in the main event”, three of whom had no business “judging” a wrestling match. And then they could not even make a decision. This should never have been included. I would have just rather we end the match as they did, and then go off the air.